Yes, Throwback Thursday is over. However, for a cute picture like this, the wait was worth it. 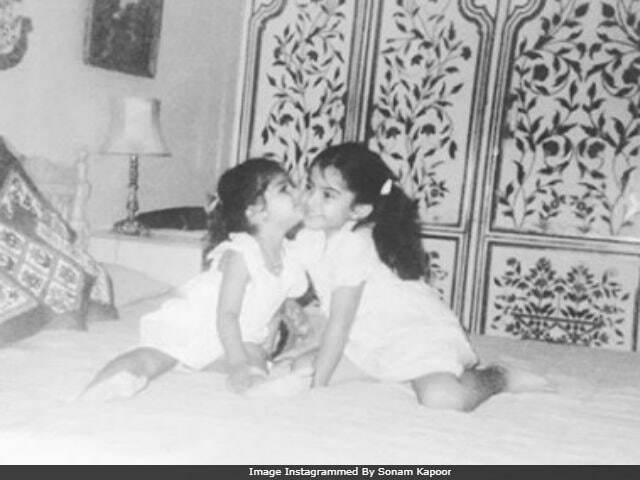 Actress Sonam Kapoor delighted her Instagram followers with an adorable throwback picture of herself and sister Rhea. In the picture, little Rhea plants a kiss on Sonam's cheek. (Awww). "They say sisters are joined at the heart, I think we're joined all the way from the hip to the heart," Sonam captioned her post, taken in 1989 (as the dateline in the picture reads). Sonam, 32, and Rhea, 30, are daughters of actor Anil Kapoor and wife Sunita. Both the sisters launched their clothing line, Rheson, a few months ago. Rhea is also producing Sonam's forthcoming film Veere Di Wedding. Here's the picture shared by Sonam Kapoor. Sonam's Veere Di Wedding also stars Kareena Kapoor, Swara Bhaskar and Shikha Talsania. It is Kareena's first film post-pregnancy. Veere Di Wedding, directed by Shashanka Ghosh, went on floors last week. The story of the film revolves around four friends played by - Kareena, Sonam, Swara and Shikha. Rhea Kapoor, who often styles Sonam for her major events, turned producer with 2010's Aisha, starring her sister. In 2014, she produced Khoobsurat, starring Sonam opposite Pakistani actor Fawad Khan. Rhea and Sonam also have a younger brother Harshvardhan, who is also an actor. Sonam Kapoor debuted in a decade ago with Sanjay Leela Bhansali's Saawariya, opposite Ranbir Kapoor. She is the star of films like Raanjhanaa, Prem Ratan Dhan Payo and Neerja. Sonam received a Special Mention at this year's National Award ceremony for her role in Neerja. Apart from Veere Di Wedding, Sonam also has Akshay Kumar's Padman in the pipeline.